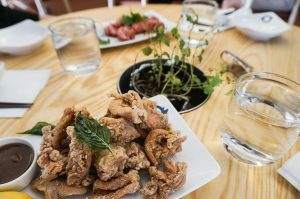 Located at 550 Main Street, between E Pender & Keefer, is one of Chinatown’s newest restaurants. 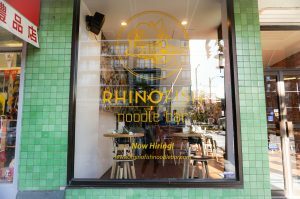 Rhinofish, a 45-seat Taiwanese noodle bar specializing in 牛肉麵 (niu rou mian), also known as the beef noodle. Made of braised beef, beef broth, vegetables and noodles, it is a popular dish in Taiwan. 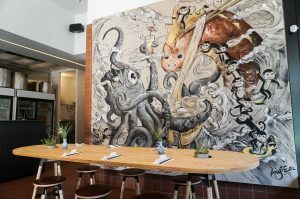 As soon as you walk in, you’re immediately drawn by the long communal tables, wood/leather stools, various planters, beautiful murals and of course, the open kitchen. Maximum transparency. It’s a really cool space. 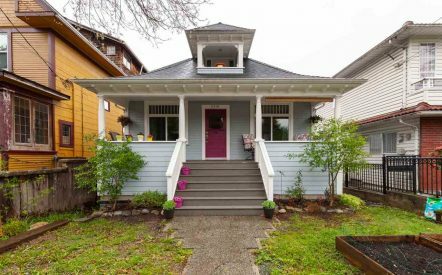 We love it, and we’re pretty sure you will too. 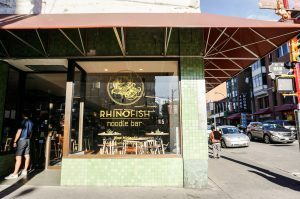 At Rhinofish Noodle Bar, only local fresh ingredients are used for cooking. The menu is simple. It includes 4 types of noodles, 1 type of rice bowl, and a few Taiwanese small plates. So what are you waiting for? 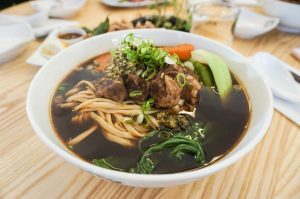 Try Chinatown’s newest Taiwanese noodle bar and let us know what you think!